One weekend in July 1985 my good fortune was to come to fruition, for I was assigned by the Bangkok Post to write-up and photograph a regatta between the King’s fleet and the Royal Thai Navy, including all the action for an event called the “Gold Cup”, which was held after the rainy season had already started. The Klai Kangwon (Summer) Palace looked superb. 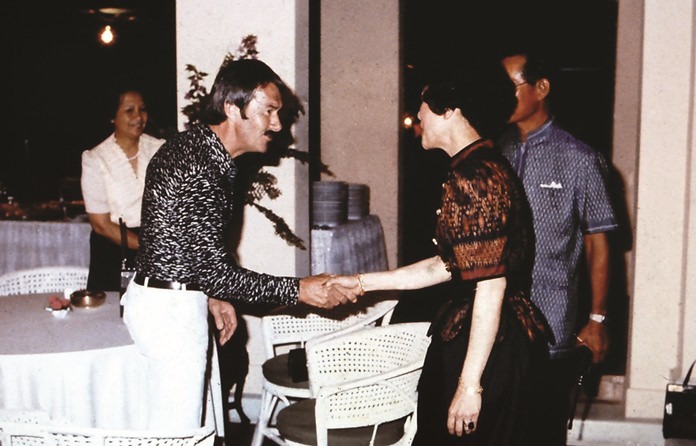 His Majesty the King greets Peter Cummins at the Klai Kangwon Palace reception. My luck was holding, for I was assigned an OK dinghy and ‘co-opted’ to join the race. 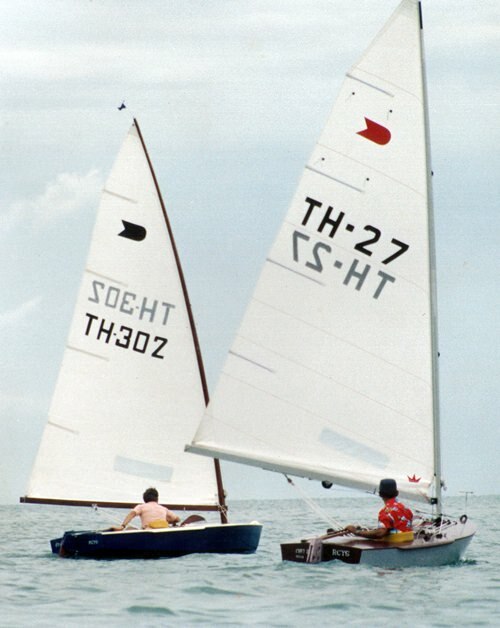 I could always write-up the story for the Post later and I was not going to miss the chance of sailing for the King’s team off Klai Kangwon where a fleet of some 100 OK dinghies were ‘housed’ and kept in “mint” condition. Klai Kangwon means, roughly, “far from worries”. What a name and location for the King who needed to be at least “worry free” for a while. The palace was built in Spanish architectural style in 1929 and was also known as the “Summer Palace”, where the King and members of the Royal Family spent the summer months. 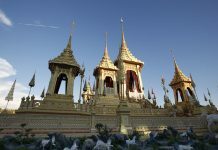 The palace consists of three mansions facing the sea and was constructed to the north of Hua Hin under the royal command of King Rama VII. 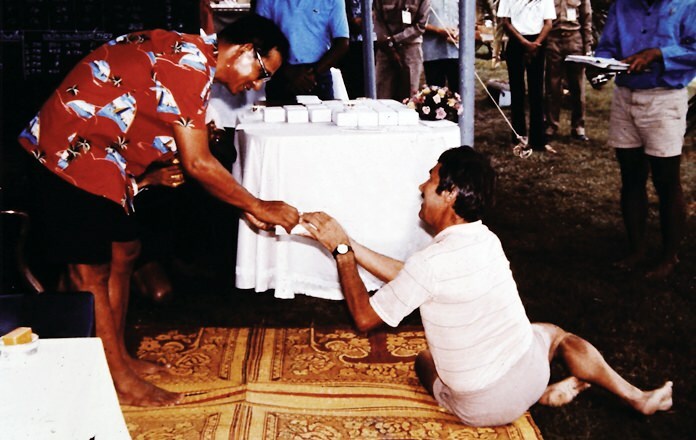 HM the King greets Peter Cummins at Klai Kangwon Palace, 1985. The palace, with its magnificent façade, stood out three-dimensional against the sparkling trees, grass and flowers which led down to the sea wall. And beyond, to delight the eye of the sailor, could be seen the upper triangle of the sails of a large fleet of OK dinghies, rigged and drawn up on the shorefront. 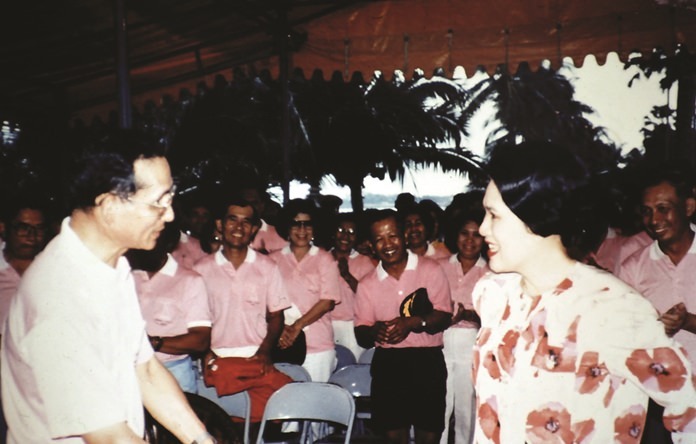 The King’s own Royal Chitralada Yacht Squadron club was annexed to the Summer Palace and, like with any gathering of sailors, it buzzed with activity and anticipation of the race to come. The conversation ceased abruptly. His Majesty appeared, smiled at the gathering, checked the wind and weather and turned his attention to the immediate priority: a dinghy race. The King talked to various members of the group who, beside being dinghy sailors, were all members of the Royal Household staff- ADC’s, police, doctors, as well as husbands of some of the Ladies of the Court – and the ladies themselves. 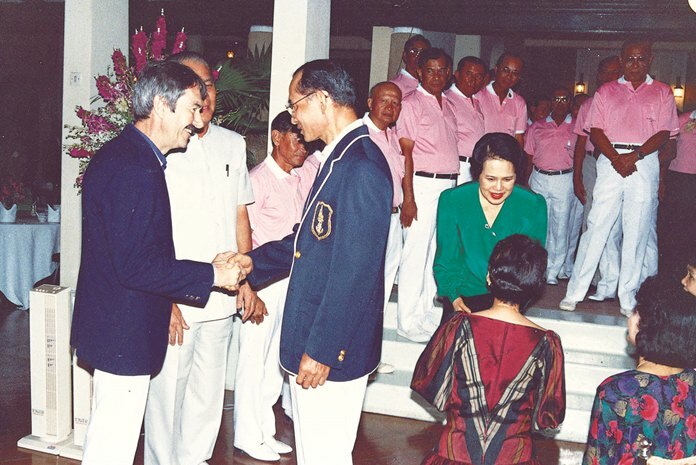 Peter Cummins accepts his “regatta “Gold” from HM the King. The King led the sailors down to the beach where the dinghies were lined up, rigged and ready for battle. The tide was low and there was a light on-shore-westerly. The King looked at one of the dinghies: “How are you going to sail in these conditions with a sail like that,” he admonished one helmsman, easing the outhaul to change the contours of the sail. Nothing escaped him; he checked a few more of the dinghies, made a few adjustments and gave helpful advice. But there was a surprise. In front of the stand which held life jackets, was a scale-model sloop-rigged yacht, about one metre long, and a remote-control panel. Their Majesties greet the Tasmanian writer. MR Ratchanee in the background. After a brief inspection, His Majesty sent the yacht out on the sea, in a strong offshore wind. The King allowed the yacht to sail about 500 meters off the shore, manipulating the remote control panel to send the yacht tacking, gybing, luffing, reaching and running. To send it out was easy; but to bring it back against the wind, tide and waves? His Majesty’s hand danced across the panel; the yacht did likewise across the sea. He even managed to bring it in to less than knee-deep water, by heeling it hard in a squall to reduce the keel depth. But, then for the serious business of dinghy racing. The fleet of OK dinghies, with His Majesty slightly to windward and in front, sailed to the start line. 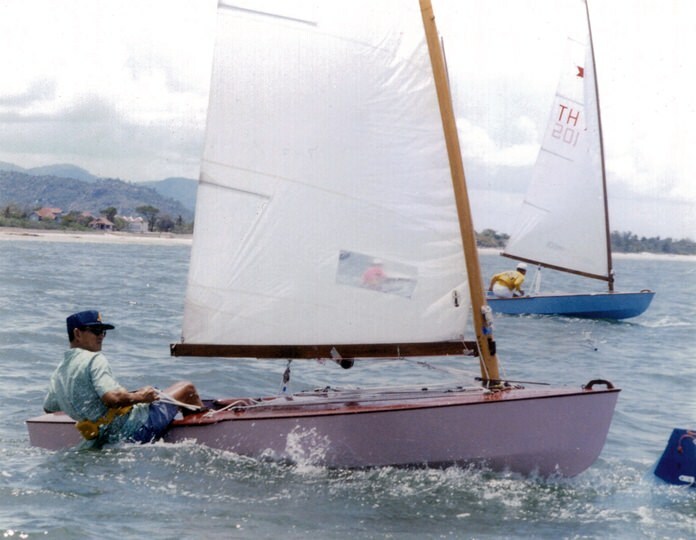 The race was sailed in light, shifting conditions and featured a very close race, with Bhisadej, Prapatphao, the Post reporter (the “Farang khun deo”), His Majesty and Krirk all close together, in that order, around most of the course. On the last beat, the winds started playing more tricks and the difficult decision was whether to play for the wind “out” or go in along the shore. Krirk and Prapatphao chose the latter and, in a very exciting finish, Krirk raced over the line 13 seconds ahead, to win the RCYS regatta. The race finished and the fleet sailed to shore – not so easy with the shifting winds. But, of course, no presentation of trophies could be made until the very last competitor had arrived. He was certainly fairly close to the shore but, the unfortunate man, who must remain anonymous, was having much trouble tacking in. It was time for the “remote control” which had worked nicely before, under His Majesty’s skilful hands. “Perhaps the batteries in the OK dinghy are not charged,” remarked one of the beached sailors, to the huge amusement of all there. One of the sailors noted that the gold tins were appropriate for several of the competitors who had received a bruise or two from body contact with dinghy gear – especially the metal boom! His Majesty patiently waited until this recalcitrant last dinghy had crossed the finish line (without the aid of the remote control, too! ), refreshments were served right there on the finishing line, and a collective sigh of relief went up from the weary sailors. An easy fifteen minute sail to the beach, running before the wind and then a good rest, was the collective thought. Peter Cummins (TH-302) closes in on the King, but was unable to keep pace with The Monarch who sailed on to line honours. But, it was not to be. His Majesty was just warming up. A Royal Thai Navy frigate on patrol duty was anchored out in the Gulf. The Vega 2 took off on a close reach to the navy ship and the King led the OK flotilla around the ship and sailed back to the beach. 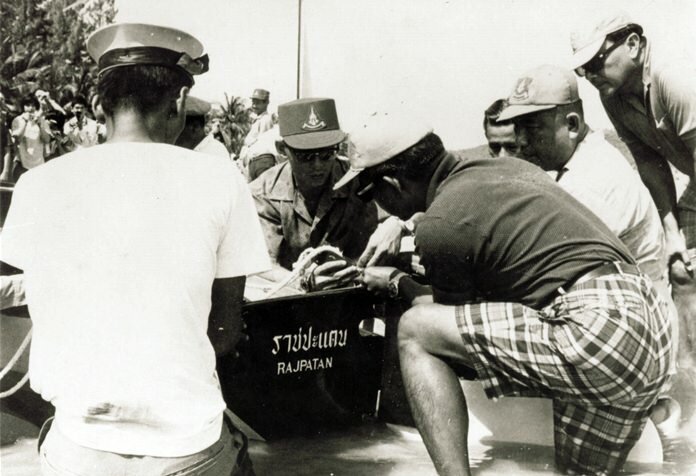 The Gold prizes (being tins of Gold Tiger balm) were then distributed and, once again, there were some special awards, including the “farang trophy” to the first-finishing farang in the regatta (the gathered sailors politely refrained from pointing out that there was only ONE farang actually competing). Drinks were served from silver trays and the competitors stood in a group around the winner. The race officer approached with a long sheet which he held at both ends, reminiscent of the ‘town crier’ of medieval times. He solemnly read out boat number, helmsman, finishing time and placing. 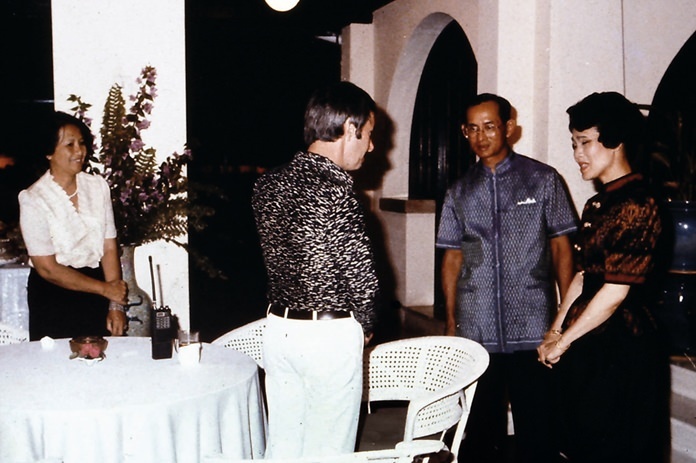 Their Majesties the King and the Queen enjoying the informal ambience at Klai Kangwon Palace. Sixth: the Post reporter (the farang). “You can do better,” said the King. Down the list. Eleventh was one of the Thai Navy sailors. “Not so good,” said His Majesty; “you did better last time.” Then, silence. The ‘town crier’ disappeared with the evidence, but the eighteenth placing out of eighteen starters (mentioned at length earlier), happened to be one of the Palace physicians. He was not to escape. “You were last,” said the King; “twelve places behind the farang, even. Nevertheless, I am happy that you are a better doctor than you are a sailor,” the King admonished the hapless sailor, to the great mirth of us all. The King led us back up the beach, into the clubhouse, took his leave of us and disappeared into the Palace. One of the best things about any sport is the “after” ambience and the camaraderie which pervades the club’s rooms when the day’s events are over. The “après-ski” best epitomizes this milieu; when the day’s stars of the slopes- and the rest – gather around the log fire, the feelings are good. At the Royal Chitrlada Yacht Squadron, the “après-voile” was special. It was a Royal reception and buffet “thank you” to the Governor and provincial officials of Petchaburi who had looked after the Royal family during their summer sojourn in Hua Hin. 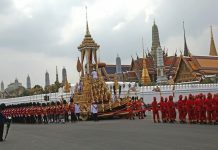 Then it was back to Bangkok for the Royal Household. 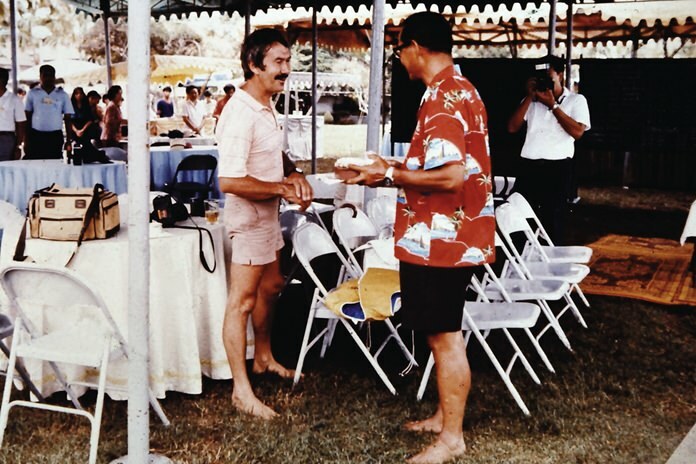 The day’s earlier heroes had abandoned their tee shirts and shorts for something a little more formal. Several wore the uniform of the Royal Thai Army, the Police and many Royal Thai Navy ratings and officers were conspicuous. Prince Bhisadej guided me through the marquees and open-air areas set-up adjoining the Palace recreation room, itself laid out with tables and chairs, neatly and simply. We had some drinks and conversed with the sailors of the day’s race, recapturing the events, like sailors from any other club. But that air of expectancy was there again; a suppressed excitement. There is a casual elegance about a gathering of Thai people that is hard to define and, in many other societies, impossible to capture at such occasions. There is an underlying friendliness; it is the essence of “sanuk”. I was taken to meet the Governor of Petchaburi Province, the chief guest of honour. He was introduced as “Head monkey-catcher of Kao Wang.” To the hilarity of the group standing around, the narrator confided that the party was really a farewell to the Governor who had not been able to catch a monkey and was therefore being transferred to take charge of the monkey section at the Dusit Zoo. “He’ll do well there; all the monkeys are in cages, already,” guffawed the narrator, to the great amusement of all those around, including the Governor. Prince Bhisadej told me to stay where I was, because the King and Queen were now coming down from their quarters in the Palace. The crowd flowed across the vast recreation hall and lined up, forming a corridor from the entrance stairs of the Palace to the recreation room. “Ah, this is a day to remember,” I mused, keeping well against the wall where the Prince had assigned me. 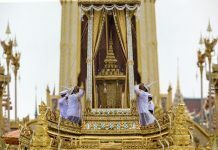 A sail with the King and, just now, a glimpse of Their Majesties, as they disappeared into the crowds AND a chance for a first-person, exclusive story of “Sailing with the King”, for the Bangkok Post. After a while, I started to feel lonely, however; the only farang, standing against this wall, no one else near. I wanted to be at least somewhere near the King and Queen, while I had the opportunity. Prince Bhisadej was obviously keeping me out of the way, afraid of my doing something outrageous or, even worse- something Tasmanian – whatever that could be! M.R. Datcharee, Prince Bhisadej’s wife, called my name. I looked around to see the Queen of Thailand. Her Majesty was wearing a silk “pa mud mee”- black and rusty brown – the ancient traditional dress of the north-east where the Queen has revived the silk industry. “He’s not a bad sailor,” said the King. He gave the very hint of a smile, that bemusement of a top-class sailor who has out-witted one with pretensions in that direction. Luckily (again), I was aware of a number of the Queen’s initiatives to help the Hilltribe people – the SUPPORT project, particularly – and I was able to talk a little about Her Majesty’s desire to help her people. The next day, as I was not exactly covered in glory from the previous race – even though I was awarded a “Gold” – I thought it better to concentrate on reporting for my newspaper. So, with my camera at the ready, I followed the fleet of OK sailors, including M.R. Datcharee, who had set out to race along the coast to a beach-side hotel. It was a reach all the way down the coast and it presented a beautiful fishing port and the gently curving hills of Hua Hin. After a good start, His Majesty led the fleet down the coast, staying some 200 meters offshore. A number of the dinghies went further out, looking for more wind; but it was those who sailed closer to the shore, such as Prince Bhisadej, who picked up what there was of the wind. It was a day that sailors call “full of holes” (great gaps in the wind) and the fleet passed the lighthouse, from where it was painfully slow to the Sailom Hotel finishing line. His Majesty, along with numerous other sailors, found the conditions tricky, to say the least! The fleet drifted to a desultory finish and the race was abandoned. With some imagination it could have been a scene from the history books. A big crowd gathered at the water’s edge to greet the King and, from there, we proceeded to the hotel where a lunch was set. Though that ended the water-borne activities for the time being, the staff and guests of the Sailom could scarcely believe their good fortune to see their King close-up, landing on their beach. A lot of hilarity pervaded the lunch and jokes were traded. M.R. Datcharee told me that, at such occasions, the King usually taps one or two of the assembly to talk. One of the younger sailors was required to speak and explain the way he and his group had “learned to sail”. It reminded me of the way we learned to swim in Tasmania – at least, in my area. We were simply thrown into the water – into a sink or swim situation, so to speak. Thus for the new sailors. “We went to the boats and sailed,” said their spokesman. My number came up and I bumbled along in a polyglot of English, Thai, and even some French to fill the gaps. M.R. Datcharee consoled me later. “We don’t know what you said, nobody understood you, but you were very entertaining,” she said. It was a rare privilege to be presented to the King and Queen, in such an informal, friendly milieu, created by a fit, active King and a beautiful, gracious Queen. But to meet their Majesties in such circumstances was an additional bonus; with the trappings of protocol barely intruding, it was a glimpse of the Monarchs as two very warm and friendly people. The King did not sail very often after the 1980s but the enthusiasm he infused into the sport has been handed over to the nation’s young sailors of today, and remains unstoppable. In next week’s final part of this series we cover the Phuket King’s Cup Regatta and His Majesty the King’s enduring maritime legacy.